I’M HOOKED. The curvy bar at the new Southtowne Pub (4260 Southtowne Dr.) is great for drinkin’ and conversatin’. Southside residents of Eau Claire have traditionally had fairly limited choices for neighborhood watering holes. However, the landscape’s been changing dramatically in the last year, and now a new spot called Southtowne Pub is adding its own mark. 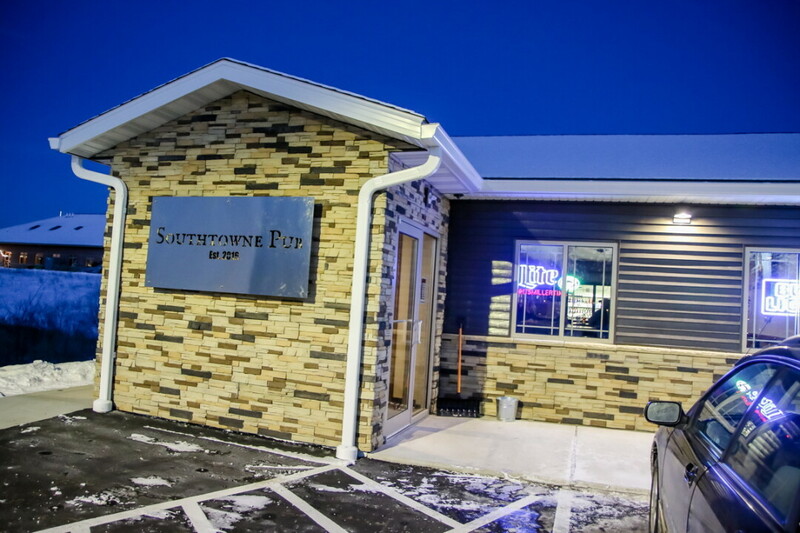 Southtowne Pub, 4260 Southtowne Drive, opened in December in a new building owned by Southtowne Corner LLC. One side of the building is a RE/MAX real estate office, and the other side was vacant, just waiting to filled with merrymakers. 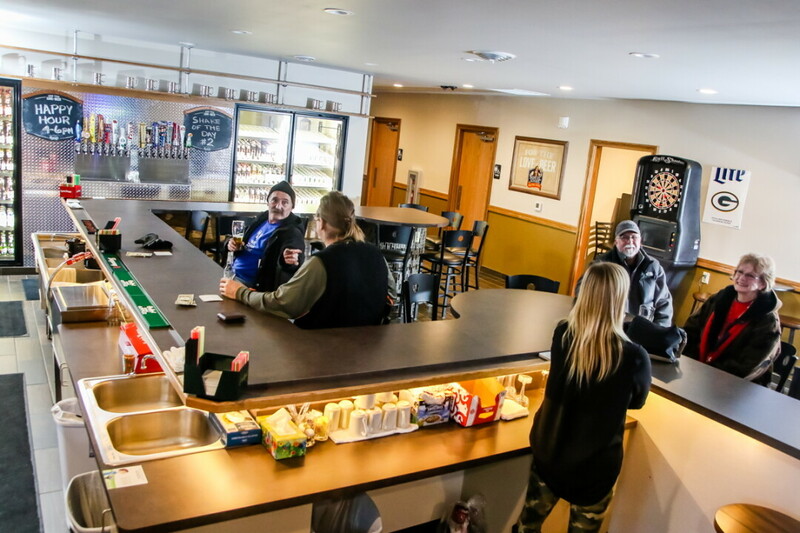 Two members of Southtowne Corner, Marty Tauger and Toby Biegel, saw potential in the space for a bar that neighbors and employees of nearby businesses could stop in after work for a drink and relax with their friends. Their instincts were right on. In one month, without any advertising, Southtowne Pub already has its own regulars and feels like your favorite ’Sconnie bar. The custom-made bar has three “bubbles” that act as tables. If you’re sitting with a group you can chat without having to lean down or miss out on what the person at the end is saying. There are 16 taps with a mix of national and local beers, such as Farmer’s Daughter by Lucette Brewing in Menomonie. Or you can choose from an assortment of cans and bottles of beer or full and single-size bottles of wine. Liquors include the usual suspects as well as New Richmond Rye, 45th Parallel Vodka, and Border Bourbon, all made at the family-run 45th Parallel Distillery in New Richmond. You can get pizza, soft pretzels, corndogs, and popcorn at the bar, or even bring takeout or get delivery from any local restaurant and enjoy it on site. Come spring, they’ll open the back patio, which overlooks the adjacent field and retention pond. Chairs, tables, and televisions will be on the patio, and the owners plan to install a humidor for cigar aficionados. Until then, expect great brews, great company, and great times on the Southside. The Southtowne Pub grand opening is planned for Friday, Jan. 27. Find the bar on Facebook at facebook.com/mortay67.